I think we caught another smile! Lucas responds to voices by turning his head and waving his arms. 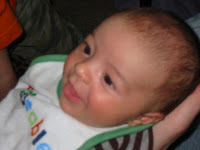 If you look at him and talk in a sing song baby voice, he rewards you with a grin. Brent gets the biggest grins. 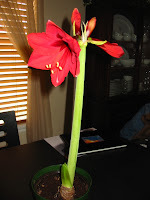 This morning we were greeted with a beautiful amaryllis flower. Thanks Mom and Dad!